Vietnam’s Ministry of Planning and Investment, with the assistance of the World Bank, is currently drafting a new FDI strategy for 2018-2023 focusing on priority sectors and quality of investments, rather than quantity. The new draft aims to increase foreign investment in high-tech industries, rather than labor-intensive sectors. Manufacturing, services, agriculture, and travel are the four major sectors in focus in the draft. The draft prioritizes FDI investments on a short-term and medium-term basis. In the short-term, industries with limited opportunities for competition will be prioritized. The draft also includes recommendations about the further removal of entry-barriers and optimizing incentives for foreign investors such that their effect on the economy is maximized. In the first 11 months of 2017, the total FDI capital including newly registered, additional funds and share purchase value reached US$ 33.09 billion, a year-on-year increase of 82.8 percent. FDI disbursed is expected to reach US$ 16 billion, an increase of 11.9 percent over the same period last year. The processing and manufacturing sector received the highest capital at US$ 14.95 billion, accounting for 45.2 percent of the total. Electricity production and distribution and real estate attracted US$ 8.37 billion and US$ 2.5 billion respectively. Japan was the leading investor amongst 112 investing countries, accounting for 27 percent of the total FDI at US$ 8.94 billion, followed by Korea and Singapore with a total registered capital of US$ 8.18 billion and US$ 4.69 billion. Ho Chi Minh attracted the highest FDI with a total registered capital of US$ 5.68 billion, accounting for 17.2 percent of the total investment capital. Bac Ninh followed at US$ 3.28 billion, while Thanh Hoa province ranked third with a total registered capital of US$ 3.16 billion. Going forward, Vietnam has to ensure that it moves away from a low labor cost economy to one focusing on technology and skilled labor. The government has to do more than just attract investments into high-value added activities. Vietnam should also focus on diversifying FDI sources, enabling domestic firms, and increasing investments in infrastructure. 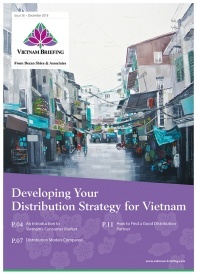 Majority of the foreign investments in Vietnam are from Korea, Japan, and Singapore. 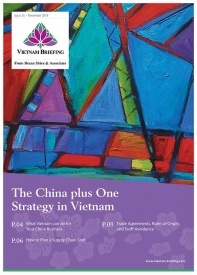 Rather than been over-dependent on Asian countries, Vietnam has to promote itself further and increase investments from the EU, US, and other countries outside Asia-Pacific. With the EU-Vietnam FTA and the Comprehensive and Progressive Agreement for Trans-Pacific Partnership (CPTPP), Vietnam has an opportunity to increase investments from countries outside Asia. 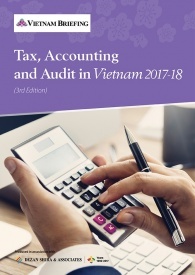 Foreign firms in Vietnam are offered huge tax and other incentives such as exemptions or reductions in corporate income tax, import duties, and VAT. However, domestic firms that already lack the capital and technology of foreign firms are not provided any of those incentives, further hampering their growth. The government has to find a fine balance between providing incentives to domestic and foreign firms to improve competitiveness. To increase linkages, the government can incentivize foreign firms engaged with local firms, if it wants FDI to have a long and positive effect on the economy. One key sector not mentioned in the draft is infrastructure. As the country progress and investments increase, infrastructure will play a crucial role in the economic development. Infrastructure projects, which are in dire need of funds in Vietnam cannot be fulfilled by the domestic sector and would require foreign capital. The government has to prioritize infrastructure projects and incentivize foreign investments to reduce the increasing gap between the current and needed investment levels. Infrastructure projects such as roads, railways, power grids, ports, and industrial parks should be a priority for the government going forward. Once the draft is finalized by the Ministry of Planning and Investment, we will have further clarity regarding the scope of their strategy.